Ascending Butterfly: Simple Ways to Keep Your 4th of July Fun, Festive and Safe! Simple Ways to Keep Your 4th of July Fun, Festive and Safe! Ascending Butterfly just wanted to take a moment to wish all of our readers a very happy, festive, fun and SAFE day! Special Thanks go out to all branches of our troops who are fighting for our freedom! Thank you for your hard work and your sacrifices. Thank you for being there, even though you really want to be home today with your family and friends! 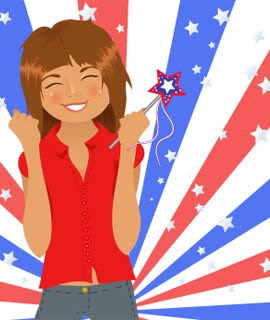 As some of you know I am also a contributing writer to Linea Pelle's Life + Style Blog, and today, I thought I'd share an article I wrote for them called 'Simple Ways to Keep Your 4th of July Fun, Festive and Safe! ', you can check it out HERE (and you can leave comments there or here if you'd like!). Do you have a military member in your life that you would like to make a 'shout out' to? Post it here! What are your plans today? A family barbecue? A day at the beach? A Parade? Are you going to see the fireworks? Whatever your plans, stay safe and have FUN!